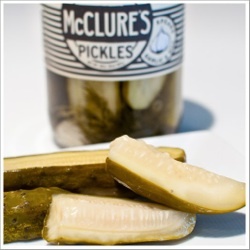 Mcclure’s Pickles - Find. Eat. Drink. - Northern Spy Food Co. Somehow in the last twenty years, pickle making went from being an old world profession to a hipster artisanal craft. If the movie “Crossing Delancey” were remade today, the lead character who lives on the Upper West Side and works in a bookstore would probably seem the anachronistic one, not the Lower East Side pickle man. Brothers Bob and Joe McClure, are the face of the new pickle movement. Bob is an actor/comedy writer and Joe is completing a doctoral degree in physiology, but their day job is crafting specialty pickles, relish, and now, drink mixtures. This past February, the brothers debuted a Spicy Bloody Mary Mixer, using the brininess of their pickle juice, the heat of cayenne and habanero peppers, and the coolness of fresh cucumber. Head mixologist at Buddakan in NYC, Joe Thompson, says it’s the only pre-mix he never has to doctor up. Bob and Joe decided to start toying with the idea of a drink mixture, since they were already encouraging people to add tomato juice to the remains of the pickle brine left in jars, after they were done eating the pickles. But customers kept asking for a ready-made product. The McClure’s path to pickle making isn’t too dissimilar from Sam Posner in Crossing Delancey, it’s a family tradition. They learned the craft from their parents and grandparents, who were using their great grandmother Lala’s recipe. New recipes are currently tested and developed by Bob in Brooklyn and then produced by Joe in their hometown of Detroit. Every jar is hand-packed, every cucumber hand-sliced. Bob and Joe provided us a gumbo recipe using their Bloody Mary Mixer. Food that won't break the bank. Amazing food, great price. Large portions of stellar food for under $10 bucks is a deal in my book. A great place to catch a show, a drink, a meal and more drinks. A huge selection of wine, liquor attached to their cheese shop. A cool vibe and brunch spots here in this part of St. Louis. I used to eat here when I was working for Ken Marshall of Marshall Farms -- One of the best places to get a breakfast in DC. No wonder it has long lines for the crab cakes, blueberry buckwheat pancakes, potatoes and on and on. Some of the best pizza we've had plus a martini menu that will keep you there for hours. Worth the 2 hour wait in line for a seat. Sandwiches... lots of them and they are tops. If you come to Michigan, you have to eat Lebanese and Middle Eastern cuisine. A great brunch/lunch spot downtown across from an abandoned lot. It is in an old converted house. Detroit's resilience best exemplified as you eat great food and look out at Detroit. It's my go to book for everything: pancakes & crepes, breads, drinks, you name it. A great array of produce, fruit and goods in an beautiful town. We sell here every week year-round. It has a long history dating back to the 1800's and we've been going there since we were kids to get produce. You won't find anything but straight shooters here and great farm produce. A huge huge market dating back to the 1800's. Has raccoon meat! Crazy array of stuff here that you could easily spend all day shopping at. Download the F.E.D. 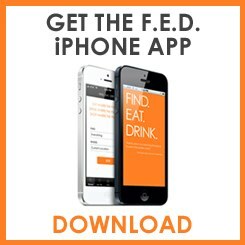 iPhone app and go where the pros go. Details of Bob and Joe McClure’s recommendations for where to eat and shop for food in Brooklyn, Detroit, Minneapolis, San Francisco, St. Louis, Tucson, and Washington DC. Artisanal pickle makers from Detroit and Brooklyn. Every jar is hand-packed, every cucumber hand-sliced. - Restaurant: Northern Spy Food Co.
- Recommendations: Northern Spy Food Co.
Photo Credit: Find. Eat. Drink. | Photograph Courtesy of McClure’s Pickles | Photo Credit: Find. Eat. Drink. Copyright ©2012 Find. Eat. Drink. LLC All rights reserved.